Bittersweet Enchantment: SPAM! No...not the food. It has come to my attention the last week or two I have been receiving several spam comments. I do not know who is doing this or why on my blog but for the time being all comments will need my approval before being displayed on my blog. I know none of my readers would do this so I am not blaming anyone. I'm sure someone bored is trolling the blogs and trying to advertise meaningless junk. I try this approach for a week or so and see how it goes. Readers, don't worry your comments will be approved quickly. :) Hopefully this will reduce the spam. Thank you for reading and if anyone else who is also a blogger owner has expreince this as well, leave me a comment. How did you handle it? I've been getting a lot of spam too ! It is so insane. I use Disquis for commenting on blogger, so I had to make it that only people with social networks/disquis accounts can comment. Girl, I'm having the same damned problem. I've been moderating for about two weeks now... No signs of it slowing down. Every. Single. Day. Six or more on various posts. Blogger was catching them for a while but they started getting through. Even with a CAPTCHA!! YUCK!! Best of luck to ya!! WRITE ON! Yup, apparently it's going on all over. 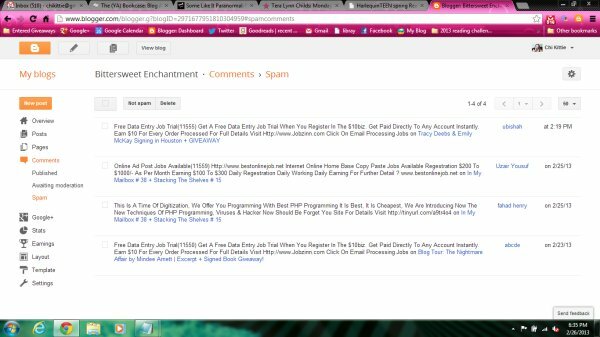 My blog was flagged as spam b/c of this and shut down by blogger. This was almost two months ago and it has yet to be restored. OMG spam is annoying! i'm currently getting around 14 spam comments a day now and I'm sick of it. I tried turning off anonymous commenting, which someone else recommended, but then the spammers starting spamming with names and the spam catcher wasn't stopping these posts from being published at all. I've turned anonymous commenting back on now, and bloggers spam catcher seems to stop a lot of those being published thankfully. It is really annoying though! Who does this and why do they bother? I have the same problem. I went from 'everybody' to 'only registered persons' because it's driving me crazy. I had the same problem 2 months ago and I'm also on Blogger. What I did is only disabled annonymous comments. Since than I haven't gotten a single spam comment. Yes!!!! This has been happening on my blog as well and it's driving me crazy! Disabling anonymous comments does nothing because these people are registered Google+ users. And they're using their accounts to spam. I tried contacting Google but got nada from them.